Steele Hill Resorts, in the heart of New Hampshire's Lakes Region, offers panoramic views of mountains and lakes from its secluded 500-acre hilltop setting. The Hilltop Restaurant, famous for its hearty New England cuisine and the spacious function facilities, is setup to host a range of functions from intimate business meetings to small conferences. 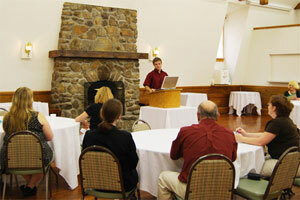 The Inn also features per person meeting package rates for your attendees, tailored to your specifications. Available to conference and group functions are 160 guest rooms and suites featuring fully equipped kitchens, living rooms and dining areas. The quiet ambiance and secluded setting of the Resort are ideal for the successful promotion of results oriented meetings and conferences. Our natural setting is perfect for clear thinking and productivity. 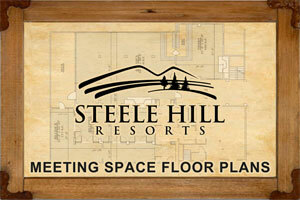 If you would like to receive additional information about holding a meeting or conference at Steele Hill Resort, complete our conferences form, or if you prefer, e-mail Penny, Our Conference Planner or call 603-581-2319.